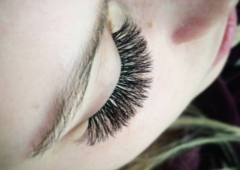 There are a handful of reputable eyelash extensions studios in Ottawa. Unfortunately though, there are many studios (largely home-based) who will perform procedures with little experience or professional care. We deal with the consequence of these lash nightmares on a weekly basis. Since eyelash extensions are not regulated, it’s easy to deceive consumers with fake portfolio pictures, lack of training/experience, and other misleading business practices. 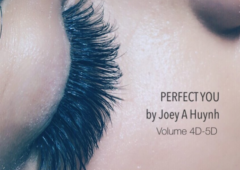 For this reason, we compiled this buyers’ guide for eyelash extensions in Ottawa. Everyone wants amazing, full, luscious lashes, without having to shell out an arm and leg. However, eyelash extensions application is extremely difficult. Mastering the delicate art of eyelash extensions takes years. From our estimates, there are only a small number of studios in Ottawa, who can be considered “professionals”. We have listed those factors here, citing relevant factors that clients have reported to us. Our belief is that consumers should be educated on the factors that matter to them most, before shelling out over $100 and taking half a day off work. If you’re interested in seeing what it takes to be an eyelash extensions technician, click here. Narcity.com and other clickbait listicle sites have weighed in on eyelash extensions, despite having exactly zero expertise in this business. This article frames their list like a review, and they have even tricked google into thinking this is accurate and useful information. The goal of the article is to not offer consumers the best information possible, but rather to serve up a list that google will push to the top of search rankings. There is no indication that the writer has ever visited the studios. So, we offer our own list, including prices and links to the studios as a truly useful and relevant buyers guides for eyelash extensions. Of course we are prejudiced about our own services, so we do ask that you take this with a grain of salt. But we stand behind this information as true and accurate. Please contact us to correct any inaccuracies, and we will change the information immediately. Studio Name Location Price: Full Set Price: Refill Licensed with City Home or Commercial? Multiple Staff? Private Procedure Room(s)? Here is a list of factors that clients tell us are important to them, in choosing an eyelash extensions studio. Health and safety. Is the studio licensed as a business, and by the health authorities? Is it insured? Is it clean and hygienic? Quality. Does the studio practice exclusively eyelash extensions? Do the lashes last for at least 5 weeks, before a new set is required? Privacy. You are on your back for up to 2 hours. You need privacy, and the lighting should also be good. Preferably sunlight and in an above-ground location (yes, some people practice in their basements). Price. Can you afford to come back to the location, on a monthly basis? If the lashes fall off before a month, then this is not affordable for most people. Exclusivity. Does the technician specialize in only lashes, or are her services spread amongst many specialities? Are you in danger of smelling strong fumes (such as from acetone) or loud noises (hair dryers)? Multiple trained staff. 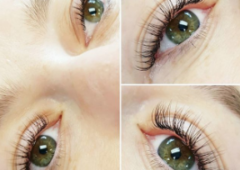 This is important, because if you fall in love with your eyelash extensions, and you’re at a studio with only one service provider, then there is a very good chance you won’t get that pre-Christmas, pre-holiday, or pre-wedding refill on time. And, if you do, there’s a good chance you’ll pay dearly for that refill. 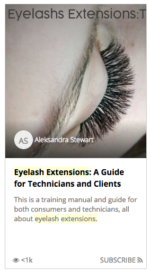 For a more comprehensive and detailed guide to eyelash extensions, please see Eyelash Extensions: The Guide by Aleksandra Stewart, the founder of Perfect You.